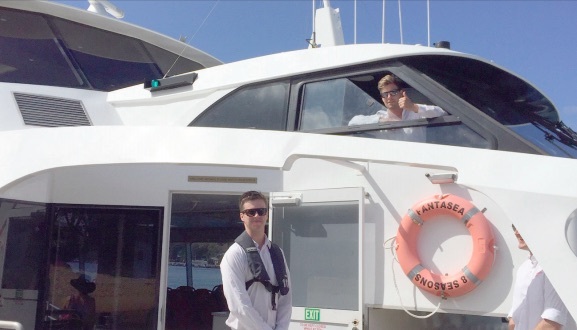 The newly-formed Peninsula Waterways Committee has welcomed the resumption of ferry services to Ettalong and Wagstaffe on Monday, November 19. He said the committee would continue to focus on “the long-term maintenance and funding of our waterways”. “A number of local residents from Wagstaffe were on hand to greet the ferry and its passengers for the various morning services, as were others at Ettalong,” Mr Allsop said. “It will take a little while for the normal passenger profile to re-establish, but these early runs certainly had their share of commuters, tradies and kids as well as the occasional day-tripper, which was great to see,” he said. “We are drawing together the collective efforts of several interest groups around Brisbane Water to consolidate the case for longterm actions in the interests of all waterways users. “We now need to ensure that Central Coast Council and the NSW Government work together to agree on the various responsibilities and actions for long-term maintenance of the waterway along with funding arrangements. “We are sure that NRMA, as new owners of the ferry service, will have exactly the same view.” Mr Allsop said organisation’s the committee had already opened dialogue with over the future maintenance of the channel included Gosford Sailing Club, various mariner operators, Wagstaffe to Killcare Community Association, Hardys Bay Residents Group. “We are open to talking with others from Ettalong, Umina and Woy Woy who have an interest,” he said. “We are on a voyage of discovery at the moment. “We found most of the parties that were interested in the issue have other businesses, this is an issue parallel to their business which means they are not focusing on it so we are trying to help that, to focus the issue to make sure it is built on fact and clear communication. “You’ve got to look at what the factual history is, not the anecdotal history and there has been some very good work done in the past, it just hasn’t been acted on. “We know the political issues and we are apolitical.” Mr Allsop said the Peninsula Waterways Committee currently had 12 active members. “It struck me the reason the NSW Government had been able to release the emergency funding was because it did not touch the Rescuing Our Waterways money. “Rescuing Our Waterways funding will not be sufficient to maintain the channel in perpetuity. “We would like to participate in an advisory capacity in whatever studies are undertaken,” he said. The committee has had preliminary meetings with the Central Coast Council mayor Cr Jane Smith, and Council chief Mr Gary Murphy. “We are meeting various councillors and state members, a variety of other marine stakeholders, and the ferry operator, and we will talk to trawler owners.